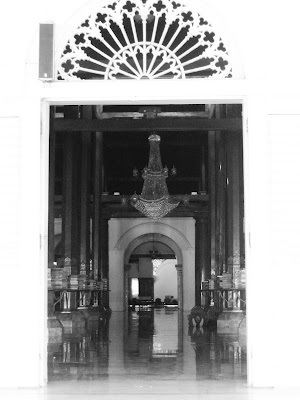 Many praying places, whatever the religion is, have great building structures, such as this old mosque (Sunan Ampel Mosque, Surabaya, Indonesia). It's the part of original building that built in 1421. Elegant, special and great photos! A nice, sharp shots. Excellent B / W.
nice shots. Even if I am not to fond of mosques I can appreciate a good shot. I like the design over the door. Good shots. 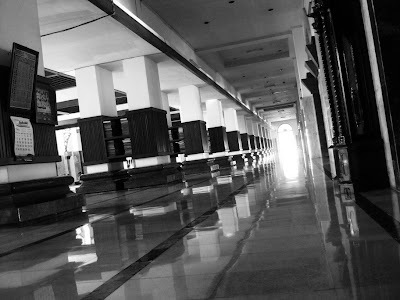 what a solemn place...very nice shot! Nice black and white photos. Really nice shots! Love the reflections on the floor which are very effectful in your b&w pictures. it's so beautiful! thanks for sharing what a mosque looks like.. I've never been inside a mosque, I'd like to visit one, these are beautiful! It's good to see a place I would otherwise not see. I like the pattern over the door.